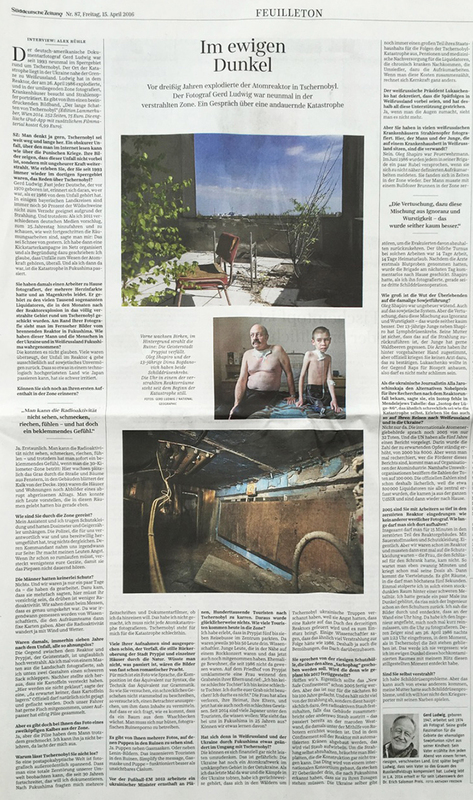 Germany’s Süddeutsche Zeitung published a comprehensive interview with Gerd Ludwig about his work documenting the aftermath of the Chernobyl nuclear disaster. 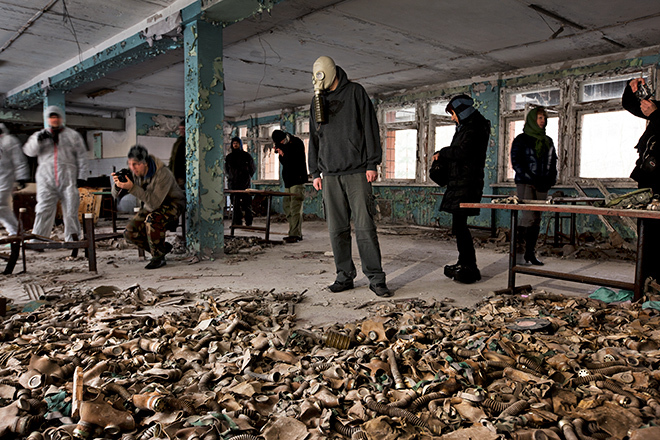 Gerd Ludwig’s Fall Update includes the latest news about The Long Shadow of Chernobyl, including a recent award, and other upcoming events and exhibitions. 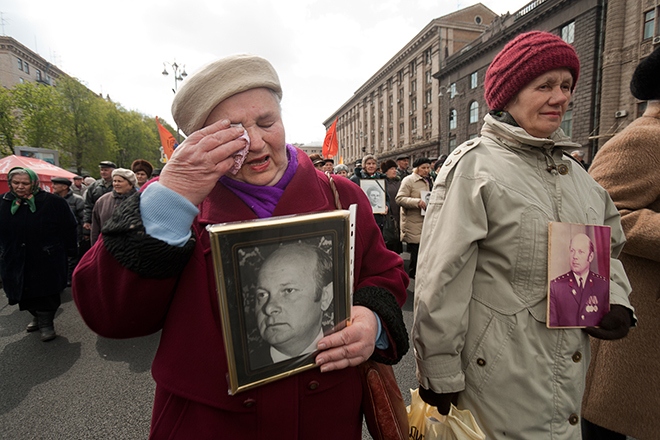 Belarusian author Svetlana Alexievich was announced as the 2015 Nobel Laureate in Literature today. Alexievich is known for her writings on Chernobyl specifically, and excerpts from her book Voices from Chernobyl were published in Gerd Ludwig’s The Long Shadow of Chernobyl. Her writings stem from hundreds of interviews, and the collection of oral history and recorded conversations are integral to her work. 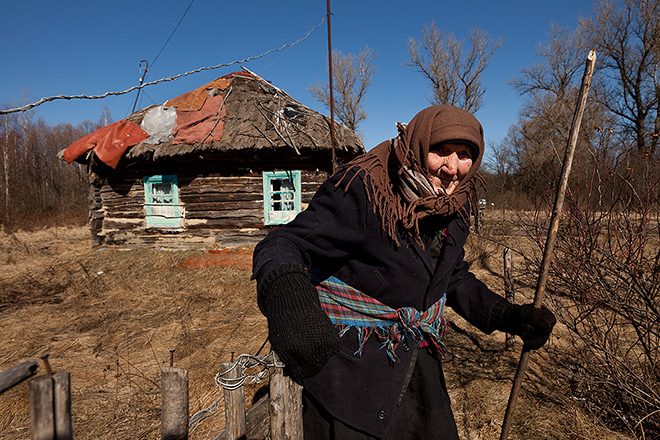 “Nuclear Tourism,” a selection of Gerd Ludwig’s photographs of tourism in the Chernobyl Exclusion Zone, will be exhibited at Visa Pour l’Image in Perpignan, August 29 – September 18, 2015. 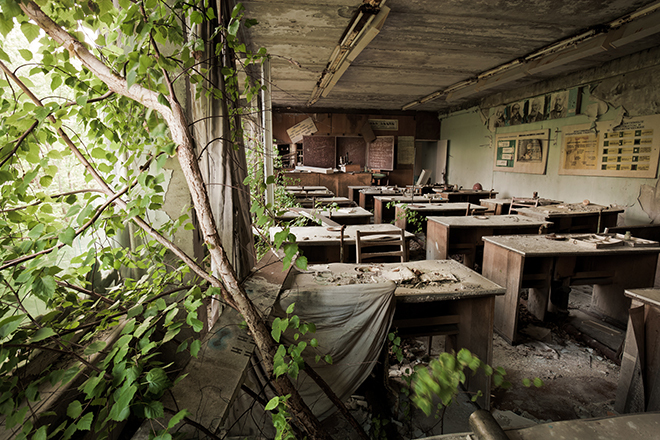 In 2011, as people around the world watched TV reports on the nuclear meltdown in Fukushima, the Ukrainian government gave approval for travel inside the Chernobyl Exclusion Zone, which has now become a disaster-tourism destination. Tourists take pictures of the sarcophagus encasing the reactor, but the top attraction is the ghost town of Pripyat, once home to nearly 50,000, now decaying and overgrown by nature, a less than truthful witness to its sudden abandonment. Visitors and tour guides have set up tableaux to evoke scenes, with, for example, a doll arranged next to a gas mask. 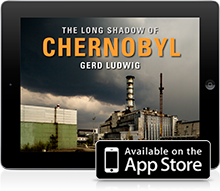 “The Long Shadow of Chernobyl” iPad app was just re-released for iOS 8, with a new design and updated material. For those who already had the earlier version, a free update is available via the App Store. Spanning Gerd Ludwig’s two decades of documentation of the aftermath of the Chernobyl nuclear catastrophe, the groundbreaking work explores the human and environmental impact since the disaster, including photos from Ludwig’s most recent trips to Chernobyl, taken in early 2011 as the crisis at Japan’s Fukushima nuclear power plant was unfolding and in 2013, as the tourist industry expanded in the Exclusion Zone. 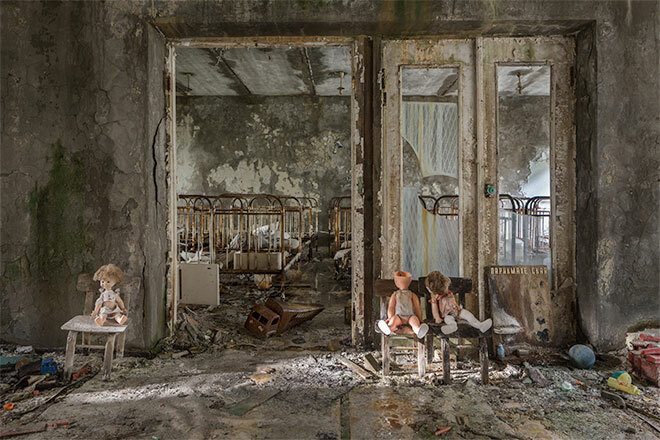 “The Long Shadow of Chernobyl” is a joint production of Gerd Ludwig Photography and Lightbox Press, now built on the ScrollMotion software platform. PDN (Photo District News) is the most important publication for professional photographers in the US, with a monthly reach of over 500,000 in print & online. PDN is the recipient of two Lucie Awards and the seven-time winner of the Neal Award for Editorial Excellence from American Business Media. Each year, in their PDN Annual competition, a panel of renowned judges from all disciplines of photography select the best works in 7 professional categories. It was just announced that Gerd Ludwig’s book, “The Long Shadow of Chernobyl,” with an essay by Mikhail Gorbachev, published by Edition Lammerhuber, was named one of the best photo books of the year in the PDN Annual.